IS this our first ‘extra screening’ of a Cert. 18 film? Michèle (Huppert, Oscar-nominated) is the head of a leading video game company, and brings a hard-headed attitude to both her personal and business lives. Verhoeven’s trademark direction casts an unsettling spell, varying the mood from scene to scene, in this widely praised, “electrifying and provocative comeback” (The Guardian). 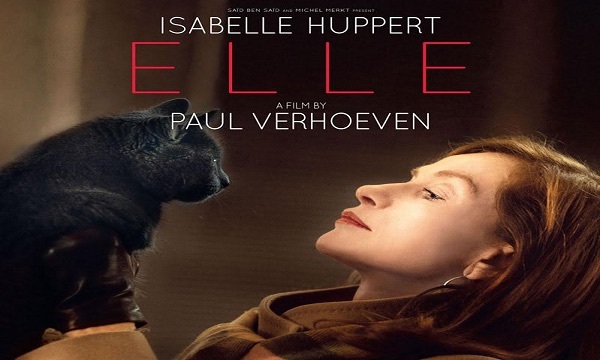 At the time of publication of this page Elle had not been released in the UK, so our regular Review link is to The Guardian written at the time of the film’s debut at Cannes 2016. That review does not include a link to any trailer (although there is a link to an interview with the star). Verhoeven casts an unsettling spell, varying the mood from scene to scene, in this widely praised, “electrifying and provocative comeback” (The Guardian). At the time of first publication of this page Elle had not yet been released in the UK, so here is the Review from The Guardian at the time of it’s debut at Cannes.